Requires neutral wiring for correct install. Refer to the user manual for Trouble Shooting Steps. The Honeywell RPLS740B 7-Day Solar Time Table Programmable Switch for Lights and Motors helps you save money by ensuring that your lights come on only when you need them. This unit works with incandescent, halogen, and fluorescent lighting, making it ideal for indoor or outdoor use. It also works with ceiling fans, bathroom fans, pond pumps, and pool pumps. Featuring three operating modes and seven programs, the 7-Day Solar Time Table Programmable Switch for Lights and Motors allows you to create programs that best suit your lifestyle. Its sleek design fits flush with standard wallplates, while the large screen and backlight provide clear viewing, even at night. Easy to install and equipped with an automatic daylight saving update, this switch works to keep energy costs down even when you're not around. The 7-Day Solar Time Table flexible programming allows you to create up to seven programs per week. The display features simple and easy to read information at a glance. View larger. 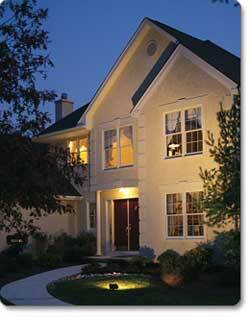 Save money on your energy bills with the Honeywell 7-Day Solar Time Table Programmable Switch for Lights and Motors. With its three different operating modes, you can customize your system to best suit your lighting needs. 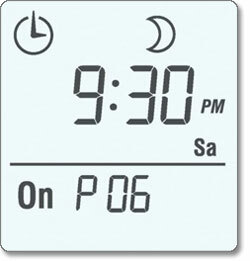 The automatic mode turns lights on at sunset and off at sunrise using the solar timetable or you can choose fixed hours to avoid having the lights on all night, while the manual setting lets you use it as a conventional switch. For extra security, the random mode works by turning lights on and off inside the house while you're on vacation. This simulates an active household, discouraging potential break-ins and giving you peace of mind while you're away. The 7-Day Solar Time Table flexible programming allows you to create up to seven programs per week. A single program can apply to one day or the entire week. Whether you want living room lights off during the day, or patio lights on after sunset, Honeywell provides you with numerous customizable options for incandescent, halogen, and fluorescent lighting systems. A handy manual override allows you to turn the light on or off without affecting the current program. For added convenience, this switch also automatically adjusts for daylight saving time so you don't have to worry about reprogramming. When you enter your home's latitude and longitude, the Solar Time Table switch calculates the sunrise and sunset times for each day of the year. The program automatically turns your lights on and off with the daylight, so you always have light when it's most useful. The switch also gives you the option of adjusting lights up to an hour before actual sunrise or sunset, ideal for places where trees block the majority of natural light. 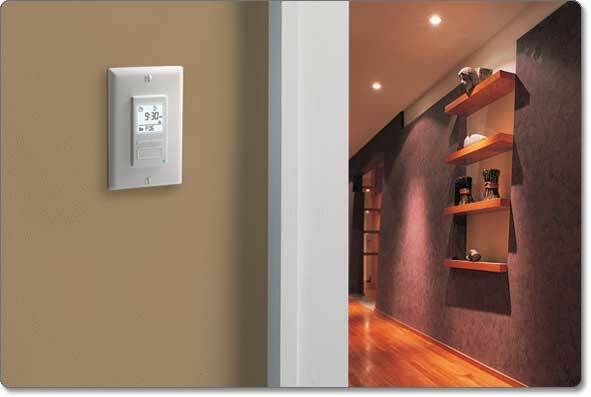 Thanks to its compact design, the Solar Time Table Programmable Switch adds a sleek and subtle touch to your room. It measures a slim 2-7/10 by 1-7/10 by 1-7/10 inches (H x W x D) for a flush fit in any standard decorative wallplate. The intuitive three-button interface makes it simple to create your programming schedule, providing a wide screen and backlight for easy viewing day or night. An LED offers you quick confirmation of its on/off status. Its large backlit screen comes with the option to stay lit up on low intensity as a nightlight and turns on its high intensity when you press either of the buttons. It installs easily with its line, neutral and load wire connection. Because the Solar Time Table works automatically, you can save money on your energy bills with the push of a button. The programming limits unnecessary use of lights, giving you more control over how much electricity you consume. Your household becomes more , and you get longer-lasting lights. The Honeywell 7-Day Solar Time Table Programmable Switch for Lights and Motors is supported by a one year limited warranty. Switch, wire connectors and instructions. adds a sleek and subtle touch to your room.